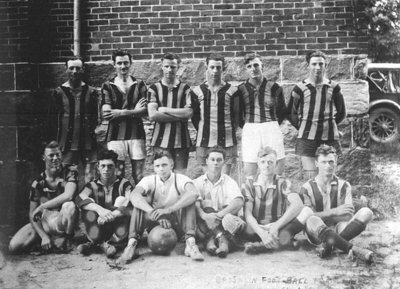 Black and white negative showing a Brooklin soccer team. They team is standing behind the Brooklin United Church. Back row: Lorne Bradley (third from left), Luther Vipond, Roy Bradley, Lewis Vipond. Front row: John Batty (second from left), Kenneth Holliday (far right). Brooklin Soccer Team, 1935, Roy Trull, Whitby Archives, 21-017-003.